Preface. Digital Appendices. Acknowledgments. List of Contributors. Introduction: Exploring Geovisualization. 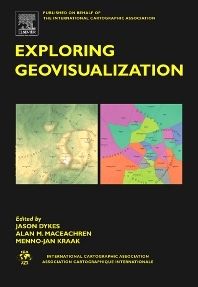 Exploring geovisualization (J. Dykes, A.M. Maceachren, M.-J. Kraak).Section A. Geovisualization in context: perspectives from related disciplines. Information visualization: scope, techniques and opportunities for geovisualization (D.A. Keim, C. Panse, M. Sips). Information visualization and the challenge of universal usability (C. Plaisant). Beyond tools: visual support for the entire process of GIScience (M. Gahegan). Section B. Creating instruments for ideation: software approaches to geovisualization perspectives. Creating instruments for ideation: software approaches to geovisualization (G. Andrienko et al.). Statistical data exploration and geographical information visualization (M. Theus). Graph drawing techniques for geographic visualization (P. Rodgers). Exploratory visualization with multiple linked views (J.C. Roberts). Visualizing, querying and summarizing individual spatio-temporal behaviour (D. Mountain). Impact of data and task characteristics on design of spatio-temporal data visualization tools (N. Andrienko, G. Andrienko, P. Gatalsky). Using multi-agent systems for GKD process tracking and steering: the land use change explorer (M. Wachowicz, Xu Ying, A. Ligtenberg). Signature exploration, a means to improve comprehension and choice within complex visualization processes: issues and opportunities (P. Noy). Facilitating interaction for geovisualization (J. Dykes). Section C. Using 3D in visualization. Using 3D in visualization (J. Wood et al.). Multim im parvo – many things in a small place (J. Wood). Geovisualization and real-time 3D computer graphics (J. Döllner). Interactive approaches to contouring and isosurfacing for geovisualization (A. Lopes, K. Brodlie). Applying "True 3D" techniques to geovisualization: an empirical study (S. Kirschenbauer). Modelling virtual environments for geovisualization: a focus on representation (L. Bodum). Web-based dissemination and visualization of operational 3D mesoscale weather models (L.A. Treinish). Section D. Connecting people, data and resources: distributed geovisualization. Connecting people, data and resources – distributed geovisualization (K. Brodlie et al.). Moving geovisualization toward support for group work (A.M. Maceachren). Models of collaborative visualization (K. Brodlie). Intelligent information integration: from infrastructure through consistency management to information visualization (M. Schroeder). A knowledge-based collaborative environment for geovisualization: ontologies for multiple perspectives on distributed data resources (Z. Kemp). Geovisualization issues in public transport applications (D. Fairbairn). Presenting route instructions on mobile devices: from textual directions to 3D visualization (V. Coors et al. ).Section E. Making useful and useable geovisualization: design and evaluation issues. Making useful and useable geovisualization: design and evaluation issues (S. Fuhrmann et al.). 3D Geovisualization and the structure of visual space (C. Ware, M. Plumlee). Applications of a cognitively informed framework for the design of interactive spatio-temporal representations (R.M. Edsall, L.R. Sidney). User-centered design of collaborative geovisualization tools (S. Fuhrmann, W. Pike). Towards multi-variate visualization of metadata describing geographic information (P. Ahonen-rainio, M.-J. Kraak). Evaluating self-organizing maps for geovisualization (E.I. Koua, M.-J. Kraak). Evaluating geographic visualization tools and methods: an approach and experiment based upon user tasks (C. Tobön). Cognitively plausible information visualization (S.I. Fabrikant, A. Skupin). Conclusion: advancing geovisualization. Advancing geovisualization (J. Dykes, A..M. Maceachren, M.-J. Kraak). Index. Sophisticated interactive maps are increasingly used to explore information - guiding us through data landscapes to provide information and prompt insight and understanding. Geovisualization is an emerging domain that draws upon disciplines such as computer science, human-computer interaction design, cognitive sciences, graphical statistics, data visualization, information visualization, geographic information science and cartography to discuss, develop and evaluate interactive cartography. In total, over 50 pages of color are provided in the book along with more than 250 color images on an enclosed CD-ROM. Computer science (particularly scientific visualization), information science (particularly information visualization and human-computer interaction), geographic information science (particularly cartography and geocomputation), statistics (particularly exploratory data analysis), and information design.